The rise of robots, automation, and artificial intelligence captures our attention like nothing else. While some of us may be looking forward to automation in professional industries, others may be dreading it. But not all experts agree with one another when it comes to the true impact of automation — your job may be more secure than you think. Almost 50% of business leaders say that automation could lead to a reduction of their workforce by 2022. Within the next decade or two, jobs like retail workers, cooks and servers, even janitors and housekeepers could see millions of jobs replaced with automation. So what does it truly take to “robot-proof” your job? When it comes down to it, the soft skills of a human being can’t exactly be automated. Humanity will only become more valuable, in fact, as automation grows and artificial intelligence tech begins taking on more professional roles. The emotional intelligence, leadership charisma, and creativity of the thinking human brain are what make us (and our careers) indispensable. It’s no wonder that customer-service roles, planning and creative work, and management are among the positions with the lowest automation potential. Automation means big changes for a lot of different industries, helping streamline operations on both small and large scale operations. But robots can’t succeed on their own — the value of humanity and creativity will be essential as automation grows. 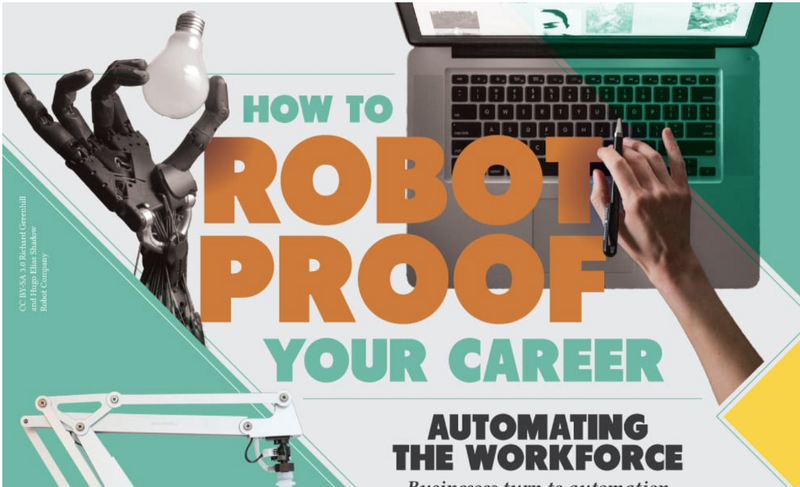 Take a look at this infographic for more detail on the future of automation and how you can build your own skills to remain an asset in an automated world. Will Robots Take Your Job? was originally published in Hacker Noon on Medium, where people are continuing the conversation by highlighting and responding to this story. Previous Previous post: Python v/s PHP: Which Programming Language to Choose in 2019?